Twin turbo V6 engines may have been around for a long time - think Nissan’s 300ZX VG30DETT engine – but for Ford in the US, they represent a radical rethinking in engine design for power and economy. Here’s the detail on the latest engine to join Ford’s stable – and the reasons Ford has built it. EcoBoost is a key Ford Motor Company initiative to deliver significant advancements in fuel economy – up to 20 percent – without sacrificing the performance customers want. The 3.5-litre EcoBoost engine delivers 365 horsepower and 350 lb.-ft. of torque across a broad rpm range, giving the power of a normally aspirated 4.6-litre V8 while, according to Ford, enjoying V6 fuel efficiency. 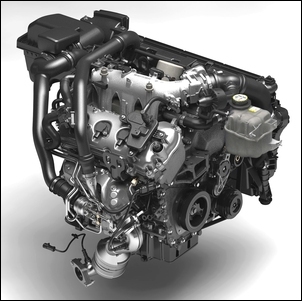 The 3.5-litre EcoBoost V6 is the first in a wave of EcoBoost engines coming from Ford. By 2013, more than 90 percent of Ford’s North American line-up will be available with EcoBoost. 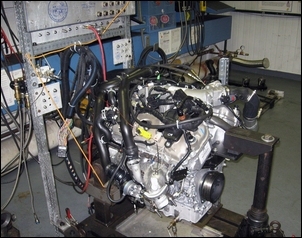 The base engine architecture comes from the Duratec 3.5-litre V6. 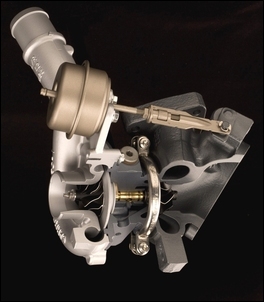 To handle the increased torque that EcoBoost delivers, upgrades were made to some of the components, including the cylinder block, crankshaft, connecting rods, pistons (note the unusual crown shape) and exhaust valves. Used are two Honeywell GT15 turbochargers with water-cooled bearings. They operate in parallel, spinning at approximately 170,000 rpm and developing up to 12 psi boost. They are rated for a 150,000-mile, 10-year life. “We’ve tested the turbochargers at a much-higher duty cycle than a customer would ever experience,” said Keith Plagens, turbo systems engineer. The simultaneous turbocharger operation paired with direct fuel injection system helps to virtually eliminate turbo lag. 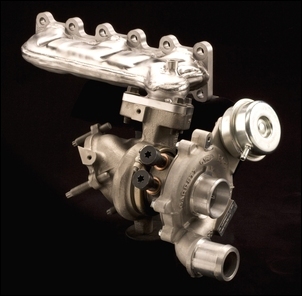 To validate their water-cooled turbo design choice, Ford engineers put EcoBoost through a special turbocharger test. The test ran EcoBoost at maximum boost flat out for a 10-minute period. Then the engine and all cooling were abruptly shut down and the turbo was left to “bake” after this high-speed operation. This process was then repeated 1,500 times without an oil change. 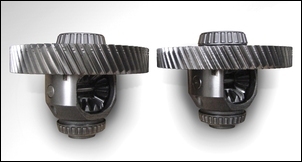 After the 1,500 cycles, the turbos were cut open for detailed technical examination and proved to be fine. EcoBoost also endured Ford’s standard engine durability test signoff. Back in the dynamometer lab, the 3.5-litre EcoBoost V6 went back up to full revs – and maximum turbo boost – for a real endurance test. This time it stayed at full throttle for 362 hours. That’s like running the 24 Hours of Daytona for more than 15 days straight. Other tests subjected EcoBoost to a gruelling range of operating temperatures. 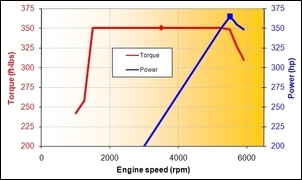 The engine uses that same grade of 5W20 engine oil specified by Ford for other gasoline engines, and oil changes are scheduled at the same 7,500-mile intervals, too. Direct fuel injection is used. 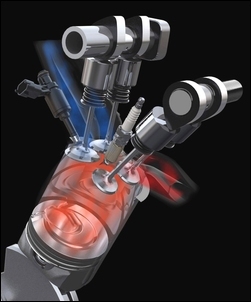 Each bank of cylinders in the V6 EcoBoost engine has a high-pressure fuel rail that feeds the individual injectors. A fuel rail pressure sensor on each rail helps the vehicle powertrain control module precisely control the fuel pressure. A cam-driven high-pressure fuel pump feeds the fuel injectors at pressures ranging from 200 to 2,175 psi, depending on customer driving. “By bringing the fuel injector right into the combustion chamber, there’s no delay from the time you inject the fuel to when it’s used by the engine,” said Hinds. 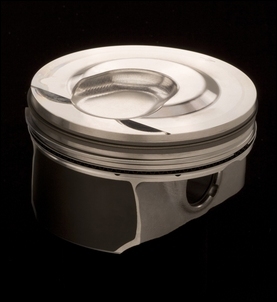 When the fuel is injected into the cylinder, it evaporates and cools the air that’s been inducted into the cylinder. The direct injection of fuel into the cylinder also helps provide a well-mixed air-fuel charge, increasing engine efficiency. 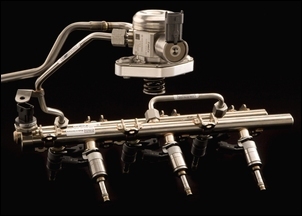 The Bosch high-pressure fuel injectors use internal solenoids to switch on and off the flow of fuel extremely precisely. Fuel flows through six tiny outlets – like pinholes – in each injector, and each spray is positioned to provide benefits in fuel economy and emissions. Electronic control system varies the timing and intensity of the fuel delivery according to engine operating conditions. “Because the fuel is directly introduced into the combustion chamber, you don’t get fuel wetting the combustion wall like with port fuel injection, you don’t saturate the ports and you don’t get droplets that might recombine and add to saturation,” Hinds said. 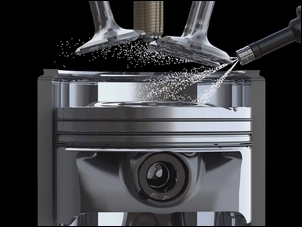 The spray pattern for the fuel was optimized after extensive modelling work, with the spray angle key to the process. The 6F-55 transmission was developed from the 6F-50 transmission to specifically respond to the increased torque demands of the EcoBoost V6 engine. Upgrades were made to the transmission’s friction material in response to the higher shift energies, and a new torque converter has been optimized for performance and fuel economy.